Shahid Kapoor and Mira Rajput, married for over two years now, always give us couple goals with their adorable pictures. Be it holding each other's hands at parties, at airports, or posting wonderful holiday pictures, Shahid and Mira, are one of the favourite celebrity couples. Shahid's Instagram account is filled with pictures of Mira and their one-year-old daughter Misha. Mira, who opened an Instagram account for the public, just last week, posted a beautiful picture of the duo last night leaving the Internet smitten. "Elegant, royal couple" are some of the comments on the picture. Mira sits elegantly on a chair while Shahid stands behind her, wearing a black suit. "I can see his face again! #hellohusband," writes Mira, who picked a royal blue Indo-western outfit. The couple seems to have gone for a party, as Shahid, while sharing a similar picture wrote, "Night out." 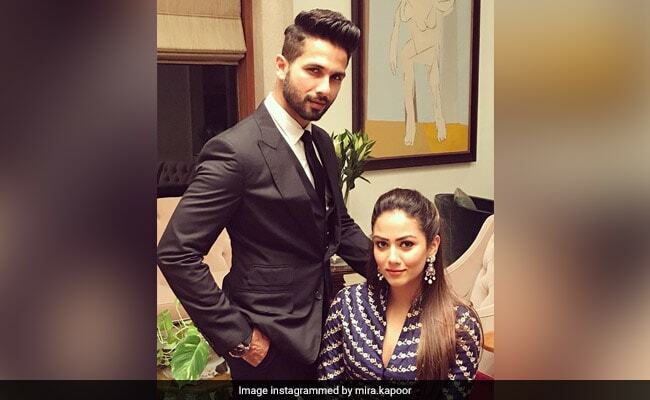 Shahid Kapoor married Mira Rajput in July 2015 in an extremely private ceremony in Delhi. Misha was born to them next year in August. The couple celebrated her first birthday in London. Shahid and Mira featured on the cover of Hello Magazine's November issue. It was their first magazine cover ever. On the work front, Shahid is currently awaiting the release of Sanjay Leela Bhansali's Padmavati, his film with Deepika Padukone and Ranveer Singh. Shahid plays Rawal Ratan Singh in the period drama while Deepika stars as his wife Rani Padmini of Chittor. Ranveer features as Alauddin Khilji, the emperor of Khilji dynasty. Padmavati releases on December 1.